Wine and cheese pairing is so passé. It’s all about the cocktails and tasty, crunchy bugs. 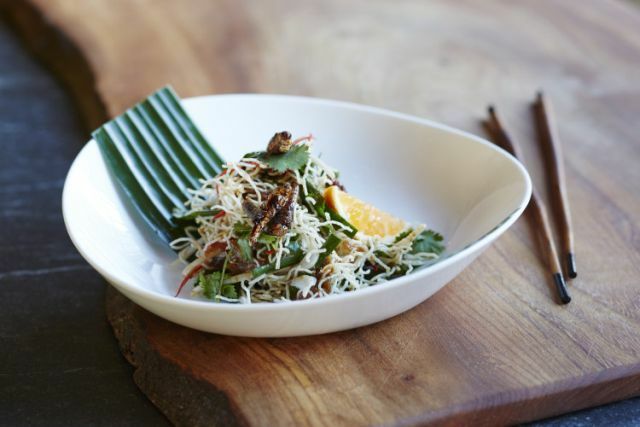 Purveyors of edible insects Grub are returning for a second time after a sell-out pop-up in Hoxton, and are just one of a growing list of invertebrate-chomping events, such as the The Deliciousness of Insects last May, which are in huge demand whenever they come to town. London Fields is the setting for Grub @ Hothouse Rooftop, with a Thai Taster menu developed by resident Grub chef Seb Holmes (of the Begging Bowl) and cocktails from Platterform, a creative force behind The Last Supperclub. Why insects, and why the demand? An inevitable reaction to the prolonged meat trend that sees us chowing down epic portions of red meat and heart-attack inducing amounts of saturated fat, it’s only natural that we would turn to a sustainable food source which is nutritious, high in protein and low in fat. In fact, 80% of the global population already consume crawlies and consider them a delicacy. We’re a bit late to the party with this one. At least we brought wine cocktails. Grub Hothouse takes place Friday 25 April at The Hothouse, Martello Street, E8 3QW, London. There are two sittings, 6.30pm or 8.30pm. Tickets cost £25 and are available via Billetto.